In addition to new zones, races, and a world PvP overhaul, Battle for Azeroth will also feature two brand new types of content: Island Expeditions and Warfronts. Both are instanced, player-capped, scenario-style features. They can either be played cooperatively against NPCs or competitively against other players. In Island Expeditions, you and two other players will explore uncharted islands around the Great Sea. Objectives will vary, focused loosely around a battle for resources between the Horde and Alliance. The same island won’t be the same each time you go. It might have a completely different situation with different NPCs or objectives. In the WoW – What’s Next panel, Ion Hazzikostas stressed the replayability of this feature. Like Mythic keystones or World Quests, Blizzard wants to create content that can be repurposed for many playthroughs. 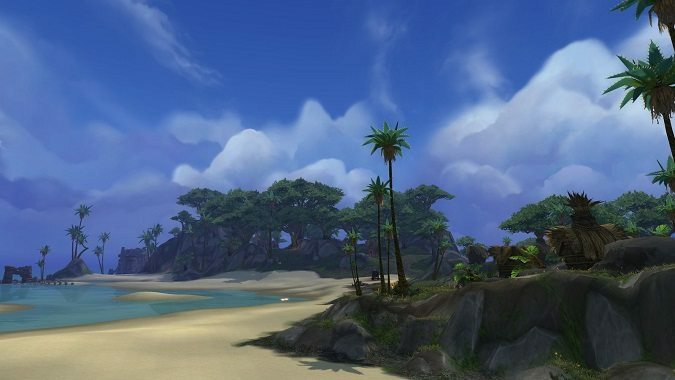 Hazzikostas talked about the “nearly infinite exploration” that Island Expeditions make possible. Hazzikostas gave examples of an island overrun by hostile trolls, one that has an ancient curse with undead rising from the ground, or one where the Mogu have set up shop. These islands won’t be limited to areas in and around the South Sea. Other regions like Northrend and Gilneas will be included, and Blizzard also showed an area that looked Pandaria-esque, so we can guess that expeditions will take place just about anywhere on Azeroth that a ship could go. Expeditions are planned to be quick and repeatable (15 to 20 minutes). Warfronts, on the other hand, are larger in scale and scope. 20 players will fight on the front lines, bringing you straight into the Battle for Azeroth at strategic locations around the world. Inspired by classic Warcraft RTS battles, players will build bases and upgrade buildings. We’ll lead troops and lay siege to enemy positions. Though it sounds like a pure PvP feature, Warfronts, like Expeditions, will have a PvE-only mode. In the PvE versions of both, the NPCs won’t be scripted like raid boss encounters — they’ll have real, advanced AI. They can work on objectives or hide and ambush your team. The PvP versions are more like PvP/PvE hybrids with players racing to complete objectives while killing each other to delay the other team. Both of these features are intended to be repeatable endgame options. Blizzard has given us an overview, but many questions remain. Will the AI live up to Blizzard’s billing? How long will a Warfront take to complete? Hopefully we’ll learn more about them later this weekend!